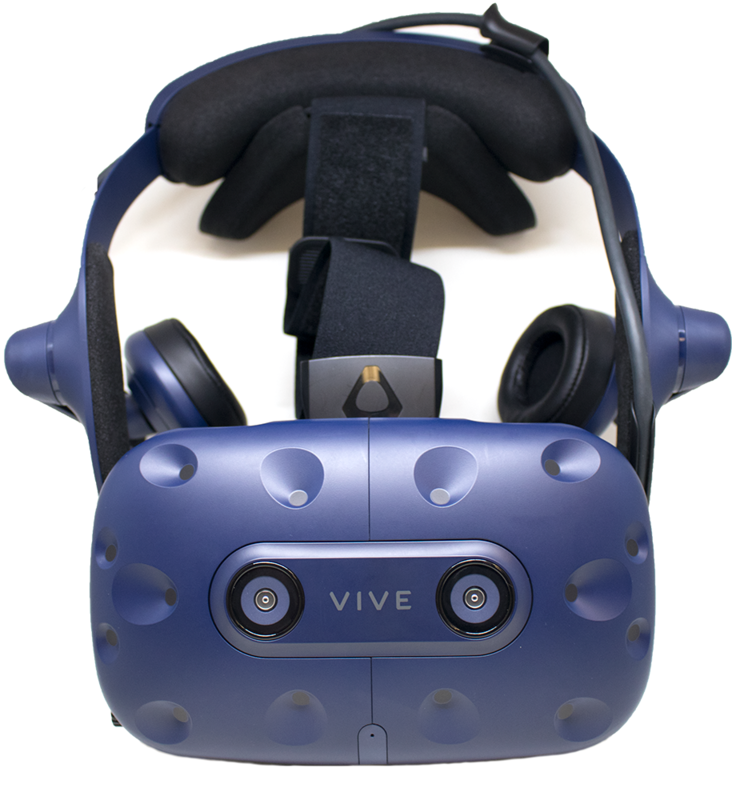 The HTC Vive Pro is the newest Virtual Reality headset that uses a room scale environment and 1 to 1 touch controllers allowing you to use your hands to interact with the virtual environment. 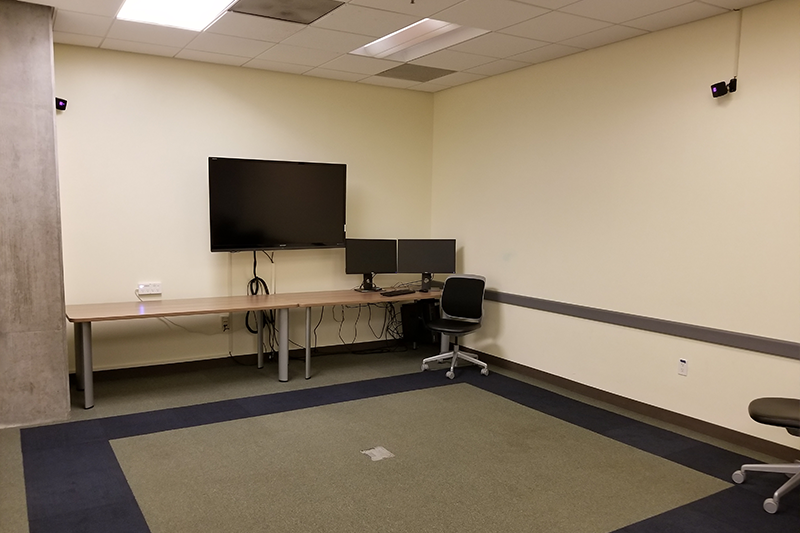 Setup includes: connecting the hardware, launching the software, and familiarizing yourself on how to interact with VR. Note: You can pick up a one-time use face cover from the front desk. Help make this guide better by filling out our response form. While in VR you can only see the virtual world and can’t see real-world obstacles. Take some time to clear out any chairs and desks from the blue play area. There are safety measures so you have a clear playspace but let people know to stay clear of the blue play zone and make sure to mind the bounds when you’re in VR. The main safety precaution is the real and virtual bounds of the playspace. You can imagine these as walls that you shouldn’t go past. Here are pictures of the real and virtual space so you can see how they correspond. Just watch your bounds, let people know to stay clear, and you should be fine. In the room you will see a blue carpet rectangle in the floor. This is the play area that the tracking follows so make sure you stay in this area. Make sure to clear out the chairs and desks from the area. In Virtual reality there are virtual boundaries that mirror the blue carpet floor. In VR you will see a virtual boundary appear when you get close to it. Make sure not to go past this so you don’t run into a wall or a desk. 1. Setting up the Hardware Start by taking the headset out of the bag and plugging the cord into the lin box under the left monitor. If the green light isn't on, click the blue button to turn on the link box. Note: It’s important to untangle the wires so you don’t trip on them. 2. Take out the controllers and turn them on by holding down the button under the track pad. Note: Make sure the controllers are charged. 3. This headset comes with built in headphones. You can change the volume up or down using the buttons on the left earphone. 4. Open the “VR - Start Here” folder from the desktop and run the SteamVR application. This will open up a green window at the bottom right of the screen which shows the status of the devices. Note: The screen will flash black when starting; that’s normal. 5. 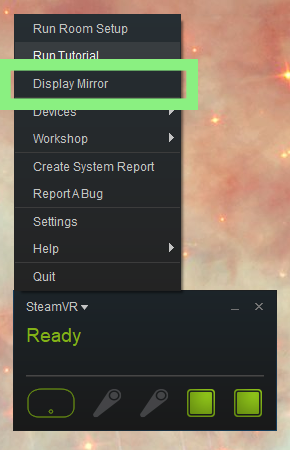 Steam VR Status Window This menu lets you know what devices are connected, make sure both controllers are connected before continuing. Congratulations! The VR setup is ready to go, check below for the Tutorial. 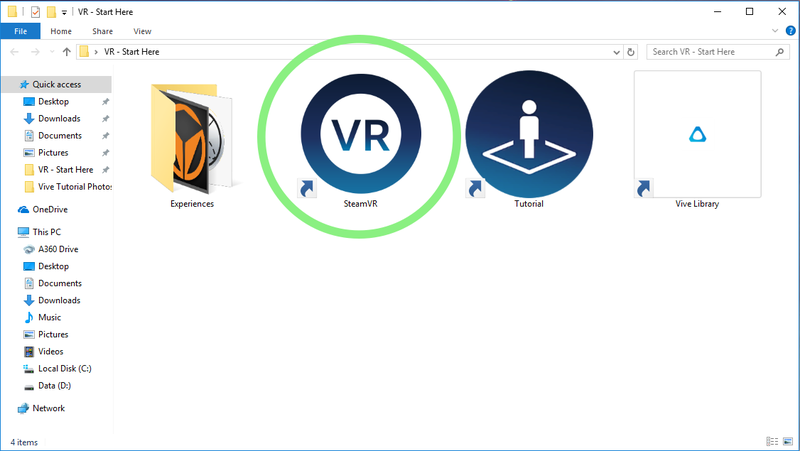 Navigating VR can be complicated at first so this tutorial is an introduction for how to go through menus, launch apps, and interact with the virtual world. 2. Open the Tutorial application and put on the headset. As you follow along the tutorial will introduce you to the controllers and how to navigate the VR space and Menus. 3. When you’ve finished the tutorial, spend some time exploring the VR home and try teleporting around to get comfortable with the space. 4. In the VR Home you can use the menu button to spawn toys in the Home, explore different environments, or change the world background. Challenge: Try to use the menu to spawn the Air Brush under Objects -> Tools. 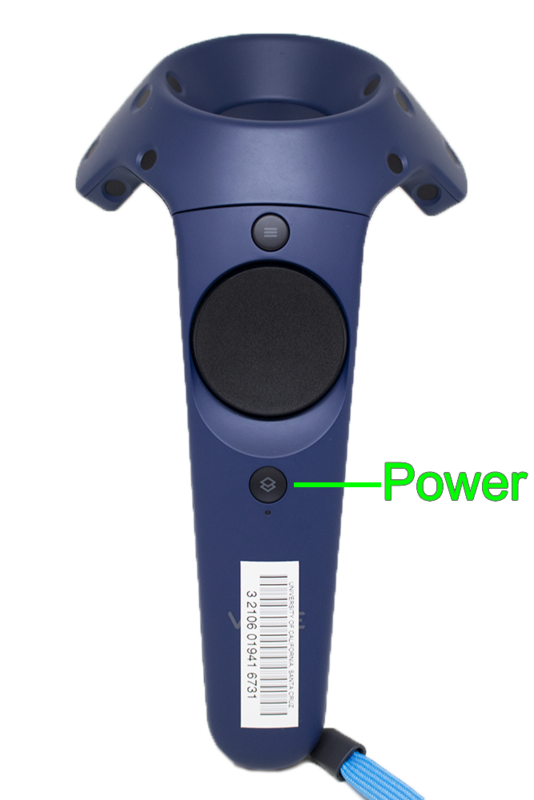 Try drawing with it then let it go using the grip buttons on the back of the controller. If you enjoy using the Air Brush you might enjoy Google’s Tilt Brush app. For most interactions, point with the controller and select with the trigger. 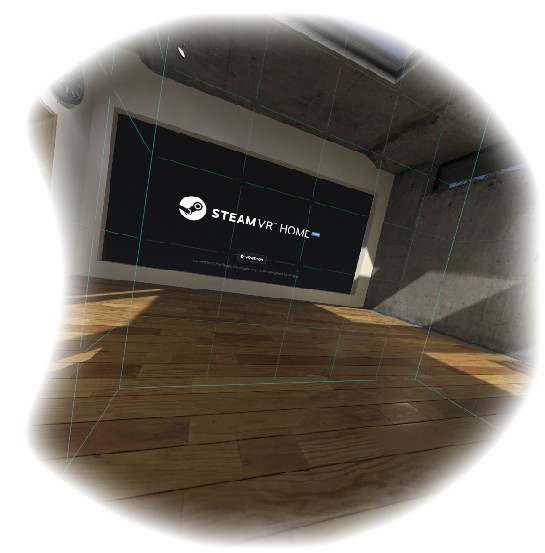 Hold down the touchpad and point at the floor to move around virtual spaces. You can see the entire list of installed games. Can be laggy at times so be ware of motion sickness. The Vive Home is where you’ll jump into VR when first putting on the headset. There’s a lot do to here and it’s a good way to get accustomed to VR. Scroll through the list by scrolling with the trackpad. Select the app you want to use using the remote’s trigger. 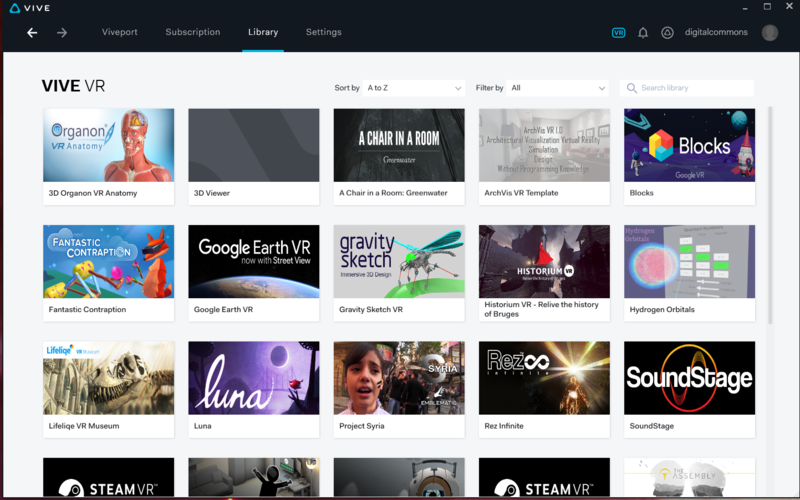 From the “VR - Start Here” folder you can open the Vive Library to see a list of installed apps. Once you’ve selected an app double click the icon and you’re good to go. Put the headset on and start! Normally when you launch a game the game will open on the monitor by default but this doesn’t show the main menu and won’t show you everything the person in VR is seeing. To mirror everything, expand the popup in the bottom right and click Display Mirror. To display on the TV, turn the TV on and put the mirrored window on the left monitor for this is the monitor the TV copies. 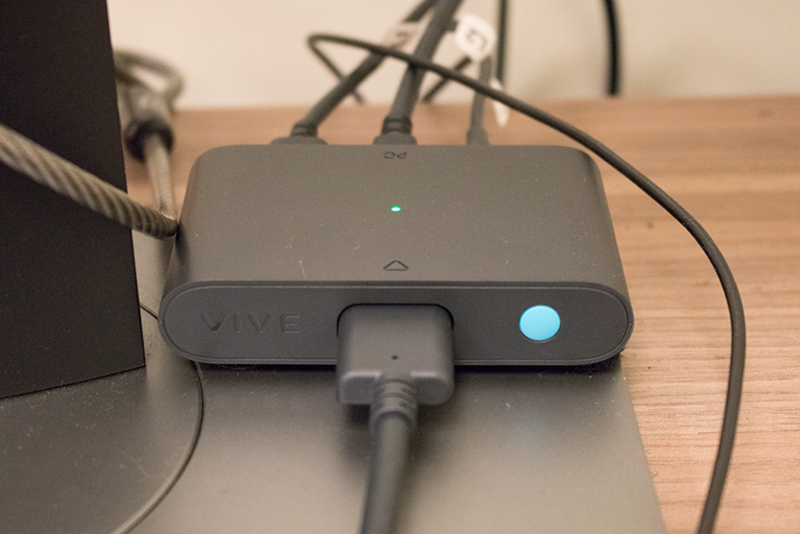 When using VR the sound settings on the computer may have changed to play out of the TV or to play out of the headphones. To change to which you prefer left click on the sound icon in the taskbar, click on the audio source (e.g. 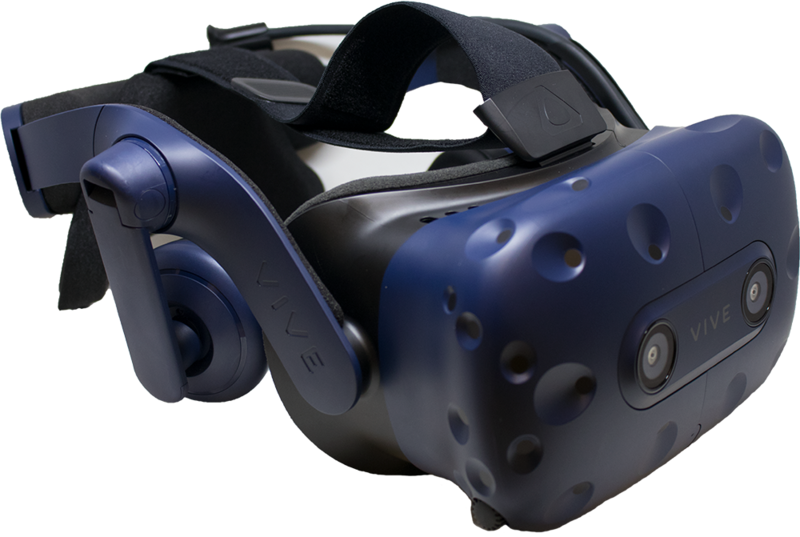 HTC-VIVE-0), and select your device from the drop down menu. You might have to restart the application to have the audio source switch. Left click the sound icon located on the bottom right of the taskbar. A box will appear allowing you to adjust the volume.